In addition to allowing me to experience the succulent dumplings of Momo Ghar, my recent journey to Morse Road with Dr. Science also introduced me to the wonders of the Saraga international grocery store, where Momo Ghar is located. Saraga is found in one of the ubiquitous Morse Road strip malls and is housed in what used to be a Toys ‘R Us store. Many people consider it to be the finest ethnic grocery store in Columbus. If ethnic food shoppers can be said to vote with their feet, that view may be right — when we were there Thursday afternoon, the place was packed with people of all stripes, buying all kinds of food that would be considered absurdly exotic and wouldn’t be found in your standard American supermarket. 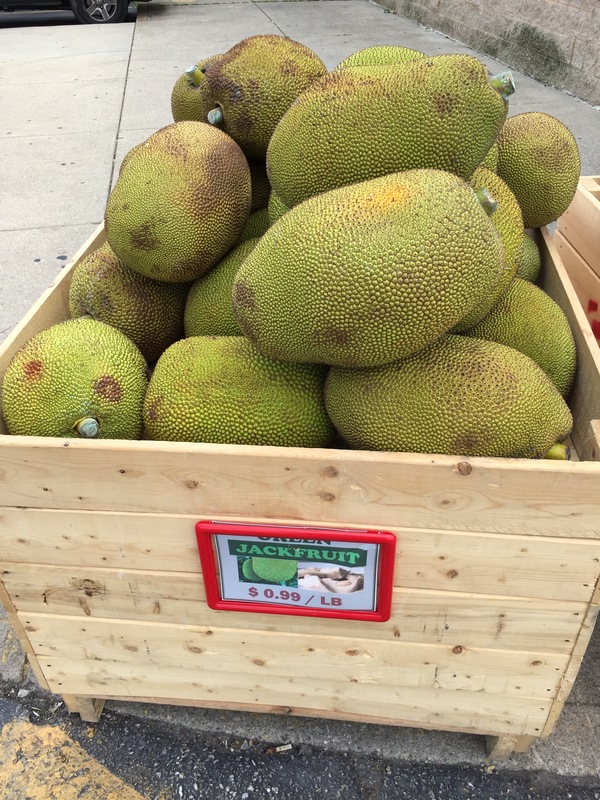 You know that you’re going to a different kind of grocery store when the first thing you encounter on your way in is an enormous crate of watermelon-sized, and disturbingly textured, jackfruit — which looks like the kind of fruit aliens should be slobbering over in a Star Trek scene. But the jackfruit is a pretty mild surprise compared to what you find inside the store. There’s an entire aisle of different kinds of frozen “pot sticker” dumplings, for example, and the place is packed with every imaginable kind of sauce and spice, heaps of unusual produce, a halal butcher shop, a Mexican bakery, a bustling fish shop, large sacks of different kinds of rice, cooking implements, and even clothing. 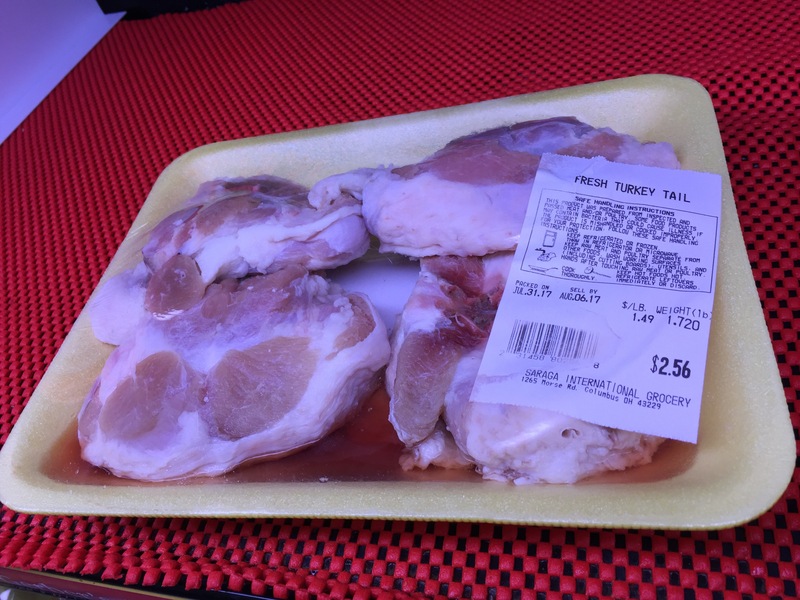 The meat aisle is particularly impressive, with lamb, goat cubes, prepackaged duck feet, and “fresh turkey tail,” among other options. I knew that some cultures like duck feet, but I found myself wondering where in the world people might confess to a hankering for some good old fresh turkey tail. What Saraga tells you is that Columbus has a large and diverse immigrant population, which is one of the many things that make our community a cool place to live. I’ll be back because I’d like to take a closer look at that pot sticker aisle and browse around in search of something interesting to have for dinner. And now I know where to go if I run across a particularly mouthwatering jackfruit and turkey tail recipe. St. Florian Roman Catholic Church is about a block away from Russell’s apartment in Hamtramck, Michigan. It is a huge, beautiful church, with a multi-colored spire that stands out in sharp relief against the blue sky that prevailed during our visit. It’s hard to accurately describe the colossal size of the church, which dominates the neighborhood, is twice the height of the neighboring homes, and can be seen from blocks away. That’s a good thing, because we knew Russell’s place was near the church, and all we had to do to find it was keep heading unerringly toward the spire. Construction of St. Florian was begun in 1926 and completed in 1928, when Hamtramck was home to thousands of Polish immigrants who came to America to taste freedom, establish a better life for their families, and obtain employment in the booming auto industry. It’s a rich and familiar American story, where immigrants brought their traditions and cuisines to the New World and, once they put down roots, wanted to establish their houses of worship there, too. St. Florian still hosts festivals with a strong ethnic flavor, and even though the neighborhood has changed in the last 90 years you’ll still find some pretty good Polish restaurants, that offer some pretty good Polish beer, located close nearby. These days, it seems, we often forget that America is truly a land of immigrants. In Hamtramck, St. Florian provides a beautiful, tangible reminder of that fact. One point that seemingly is lost in this discussion is how we are going to pay for this leisure time. In the 20th century, utopians dreams about people having more leisure time involved the use of labor-saving devices that people purchased with their paychecks, not government programs that discouraged people from taking on work that was available to them and that they were capable of doing. One obvious question from the CBO report is, who is going to pay for the subsidies (and the other ever-growing government programs) if people are working fewer hours and therefore paying less in taxes? But let’s lay aside the issue of who is going to pay for all of this, and focus instead on work as a standalone concept. If America as a country has really reached the point where people are debating the value of working, then we have strayed far from the very deep roots of our culture. Our Puritan forefathers believed that work promoted qualities, like industriousness, that were crucial to a successful social order. Pioneers and farmers worked from dawn to dusk. Immigrants were attracted to our country because the Land of Opportunity afforded the opportunity to work and build a better future for their families. For generations, all American political parties agreed that work was good — indeed, essential — and that our goal should be to achieve full employment. Now, apparently, that unanimous view is fracturing. I’m one of those people who believes that work is a good thing. I think working involves important values, like personal pride and self-reliance and selflessness, in that many of us who are working are doing so to provide better lives and opportunities for our families. I think working gives structure to our lives and promotes qualities like cooperation and teamwork that you simply don’t develop sitting at home. I’m not opposed to leisure time, but I think it should be earned — not encouraged by government subsidies. And I wonder how much of that government-subsidized leisure time that some people are now extolling will be used productively, and how much will be frittered away watching the TV or indulging in other time-wasting or even personally destructive activities? Work is work, and it is a good thing. I’m amazed that the topic is even open for debate. Kish did a lot of research before we took this trip to Paris. Among other things, she read and printed out a number of “3 Days in Paris”-type articles from various newspapers, and we’ve used them, productively, as helpful guides during our visit. One neighborhoods described in one of the articles was Belleville. It was depicted as a charming, off-the-beaten path, upcoming area of new art galleries and friendly wine bars that loved drop-in clientele, so we thought it would be a good spot for a stroll and a glass. When we emerged from the Belleville Metro stop, however, we found a place that was radically different than the travel writer’s depiction. Rather than charm, we found a gritty place of worn and uninspired modern buildings. 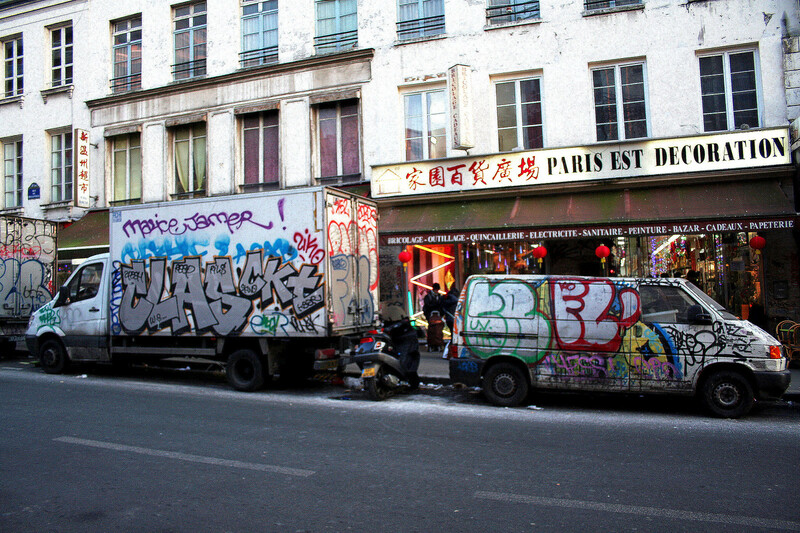 We couldn’t find the places mentioned in the article because Belleville is so off the beaten path that its streets aren’t even shown on the map we have carried around the city — and when we tried to leave the main streets to find the charm, we found desolate side streets that made me feel physically insecure for the first time on our visit to Paris. So, after having lunch at a Vietnamese bistro and then wandering around for a while among shops that offered cheap discount clothing, lots of Asian-lettered businesses, and panel trucks covered with graffiti, we retreated back to the center of the old city. Kish and I both agreed that the visit to Belleville was interesting, because it showed that Paris is not just a fairyland of medieval churches and fountains and beautiful apartment buildings. Belleville clearly is a place where recent blue-collar immigrants to the city go to find affordable places to live. We also wondered whether it showed the challenge of the modern travel writer who must try to find something new to say about a city as oft-visited as Paris. No doubt there are nicer parts of Belleville than what we found, but we wondered whether the travel writer’s overarching quest for the new produced a bit of exaggeration. Next time, we’ll do a Google search, too, before we venture off to a new place. All day today police have been on a manhunt in Boston. They are looking for Dzhokhar Tsarnaev, a 19-year-old who is a suspect in the Boston Marathon bombing and who was involved in a shootout with police last night. Tsarnaev somehow eluded capture and is on the loose in the Boston area. His brother, also a suspect, was killed in the shootout. The news stories today are all about these brothers, who came to the U.S., lived here, and somehow became radicalized to the point where they ruthlessly killed innocents without a second thought. I’m sure many people enjoyed hearing that the dead brother’s body was so riddled with bullet holes they couldn’t even be counted; there is still force to the notion of an eye for an eye and a thirst for outright vengeance. But as Kish and I drove around Nashville today, listening to reporters interview people who knew Dzhokhar Tsarnaev, I found myself trying to choke back the bloodlust and hoping that the authorities can somehow catch him alive. The reports all speak of an immigrant who became assimilated in our culture, had American friends, was a star on the wrestling team, and because a citizen on September 11, 2012. What happened to this kid? How did he go from a wrestler who helped motivate his teammates to a cold-blooded killer who dropped off a backpack with a bomb loaded with shrapnel and designed to inflict as much death and damage as possible? We can’t wait for terrorists to show up, commit their cowardly terrorist acts, and then try to kill them off. That strategy will never work in an open society like ours. Terrorists could go to any large American city and, on any given weekend, find countless events that could be the subject of a terrorist act. We need to figure out what causes someone like Dzhokhar Tsarnaev to become a terrorist in the first place. We need to understand, and then we need to determine how to prevent terrorist radicalism from incubating in the hearts and souls of the Dzhokhar Tsarnaevs of the world . . . or we will never be safe.